Building a Theological Library: what and what not to do. "To the making of books there is no end." So says Ecclesiastes 12:12. And if Amazon is any indicator, this piece of ancient wisdom is still correct. I often have students ask me about the best resources or which commentaries they should buy. Anyone who has experience in this field knows this is not an easy question to answer. I usually begin my with "well it depends . . . "
Marcus Maher over at Seeking the Truth has listed eight points to help you when thinking about building a theological library. Books, especially commentaries, are expensive. Try to preview them in some way before you buy them. This will save you money and disappointment. There are so many good books to buy. So many! Often times I've learned about a book and gotten really excited about a book and wanted to buy it only to have my initial excitement wear off a few days later. To combat this, I've instituted a waiting period before I buy anything to guard myself against impulse purchases. A good theological library should contain commentaries, bible dictionaries, introductory books covering portions of Scripture (NT, OT, Paul, the Gospels, the prophets, etc.) both of the historical critical type and the theological type, systematic theology texts, books of historical theology, lexicons and grammars, books on church history, and some basic references on the Apocrypha, Pseudepigrapha, and the Apostolic Fathers. You also should buy important monographs within each of these fields that provide in-depth studies on various matters. it's cheap or it's by an author you like. I've seen the former mistake made often, especially related to commentaries. You have a lacuna in your library so when you see a book or series on sale that addresses your need you jump on it. Hold your horses, especially if you don't know much about the book/series you're buying. No tradition gets everything right and there's great benefit to seeing Scripture from different angles. Especially when buying commentaries, try to buy books from several different positions. There are a lot of good works out there by dead guys. Read them! I know that good reference books are expensive but you need to have enough books on your shelf that when you have a question about a particular passage or a significant topic you have a place or two to start looking for answers. You never know when that question will pop up, so it's best to be prepared in advance. When building your library, try to be other focused. Encourage people to borrow from you. Don't be afraid to give away a book that has been helpful to you. 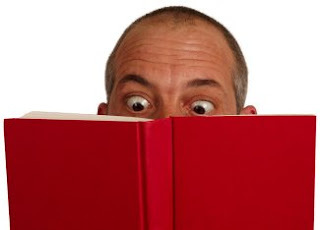 I mentioned once before that it is not unusual for me to be reading several books at one time. This week is no different. I just finished N.T. Wright Scripture and the authority of God. I didn't realize when I bought it that it was a second edition of The Last Word, but since I hadn't read that one I was not upset. Earlier this week I started two other books. Scot Mcknight's One Life Zondervan, 2011) and Carolyn Custis James When Life and Beliefs Collide (zondervan, 2002). On the floor next to the bed I have Ken Follet The Pillars of the Earth (Signet, 2010). Actually, I read it a few years back, but wanted to read it again before I watch the mini-series that was made last year. That is what I am reading at home. At work, besides emails and student papers, I have a number of commentaries and articles on 1 & 2 Thessalonians for the commentary I am writing. Historians Admit To Inventing Ancient Greeks! 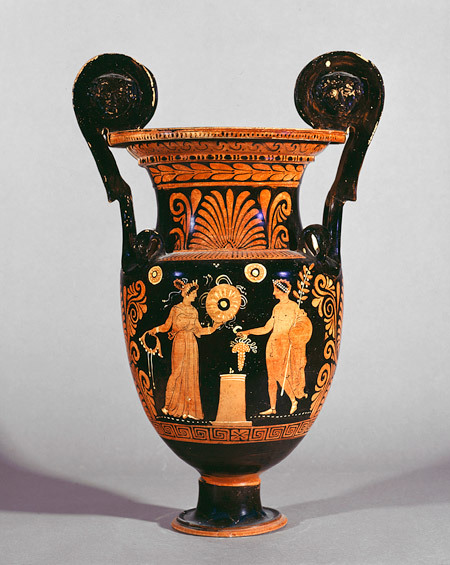 The group acknowledged that the idea of a sophisticated, flourishing society existing in Greece more than two millennia ago was a complete fiction created by a team of some two dozen historians, anthropologists, and classicists who worked nonstop between 1971 and 1974 to forge "Greek" documents and artifacts. "Honestly, we never meant for things to go this far," said Professor Gene Haddlebury, who has offered to resign his position as chair of Hellenic Studies at Georgetown University. "We were young and trying to advance our careers, so we just started making things up: Homer, Aristotle, Socrates, Hippocrates, the lever and fulcrum, rhetoric, ethics, all the different kinds of columns—everything." "Way more stuff than any one civilization could have come up with, obviously," he added. Are the Passion Narratives Prophecy Historicized? Mark Goodacre has been very busy lately producing episodes for his NT Pod. 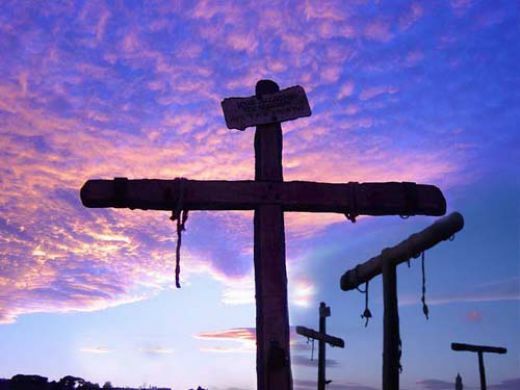 This week, in time for Easter, Goodacre looks at the Passion narratives and the Old Testament scriptures that are quoted in those narratives. He asks an important historical question. Did the authors of the gospels take statements found in the Psalms and the Prophets, and then historicize them? That is, did they include these as details in the narrative and build around them? Did the authors lack detailed information about Jesus' crucifixion and, to fill out the story, go to the Old Testament and include bits of prophecy to make it seem as if these things happened? Goodacre examines the theories of John Dominick Crossan and explains why he disagrees with Crossan. Instead he argues for something called "scripture realization." Goodacre does a good job of explaining what the gospel authors were doing with scripture when they wrote about the death of Jesus. Update: True Source of Jacobvici's Jesus Nails Revealed! 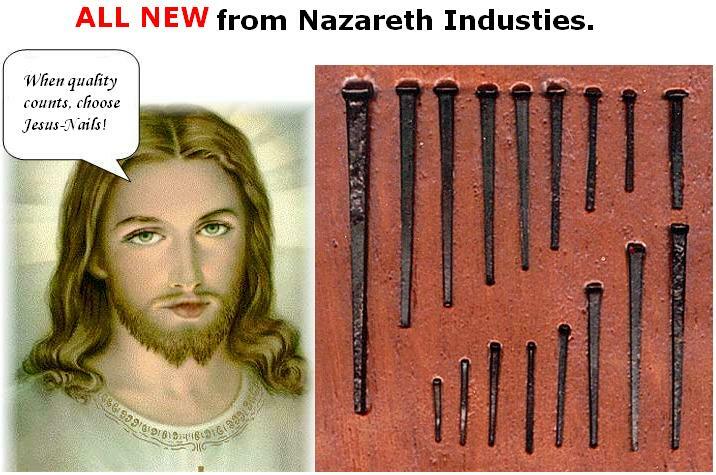 Secret sources have told me that Jacobvici did not find his "Jesus Nails" in a lab in Tel-Aviv, but in a hardware store in Nazareth. Forget those silly lead codices. We've got the nails from Jesus' crucifixion! Well folks, it is a week before Easter and the purveyors of hype and pseudo-scholarship are at it again. Forget the Lead Codices. They are old news and probably fakes anyway. The Jerusalem post and the Daily Mail are reporting that Simcha Jacobvici, A.K.A the Naked Archaeologist, (don't worry parents he is fully clothed for this blog entry) has discovered some of the nails used at Jesus' crucifixion. Jacobvici has a new documentary coming out on Discovery Channel titled Nails of the Cross. 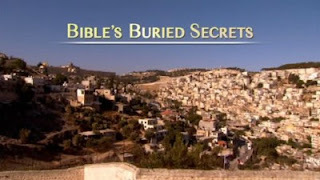 He claims that a tomb discovered in 1990 outside of Jerusalem, identified as belonging to the High Priest Caiaphas, yielded a number of artifacts including two nails. 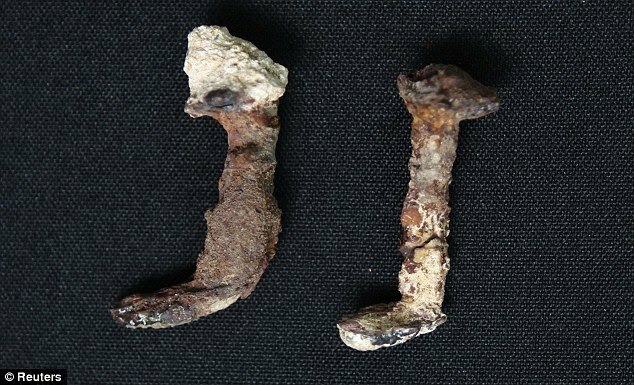 These nails were found among the ossuaries discovered in the tomb. One was found in an ossuary, the other outside of it. The nails were removed from the tomb along with other artifacts and taken to a lab in Tel-Aviv. Jacobvici claims that they "mysteriously disappeared" and tells how he found the missing nails. Ah, conspiracy. Always a good way to promote a story. In an interview for the Jerusalem Post he had this to say about his "discovery." "What we are bringing to the world is the best archaeological argument ever made that two of the nails from the crucifixion of Jesus have been found," he said in an interview, wearing his trademark traditional knitted cap. "Do I know 100 percent yes, these are them? I don't." On the other hand, all of the scholars contacted by Reuters expressed doubt about his claims. A more plausible explanation has been offered by one of my former professors, Gabriel Barkay. Barkay said no proof existed that the pair of Roman nails in the Tel Aviv University lab were the ones found in the tomb of the Caiaphas clan, but said it was both 'probable' and 'possible.' If they were the ones found in the tomb, they could have been placed there for many other reasons, for example after using them to make inscriptions or as a charm to ward off evil, but he agreed the nails were significant and should not have been ignored by the finders. Of course Jacobvici has not yet said why he thinks these are the nails from Jesus' crucifixion and if they are why would Caiaphas have them in his possession not to mention his tomb! Perhaps Caiaphas kept them as souvenirs? Perhaps he is a reader of the Wittenburg Door which reported in February of 2008 that three nails of the used to crucify Jesus were for sale on the French eBay site. As the authors of the article notes, if these are the real nails then they have done a lot traveling. The Wittenburg Door provides a brief history of the nails' history from their discovery by Constantine's mother to Hitler. Hey, has anyone checked the record of Jacobvici's past purchases on eBay? Don't want to make word for it? Still think there might be some truth to this whole story? Checkout Bob Cargill's blog. He will dissuade you further. Also, Mark Goodacre posted a Blackadder video dealing with relics. Last week I posted one of the episodes from the BBC's recent series the Bible's Buried Secrets. That episode looked at the question of whether or not God had a wife. This week all three episodes were made available online. Whatever you think of the series and the opinions of its host Francesca Starakopoulou it is worth watching to learn about some of the ambiguity of history and the problems the confront biblical scholars. So for those of us who can't watch the BBC in are area -Enjoy! Thanks to Remnants of the Giants for pointing this out. A national hero and icon for the Jewish people, and a divine king for Christians, David is best known as the boy-warrior who defeated the Philistine giant Goliath. As king, he united the tribes of Israel. But did he really rule over a vast Israelite kingdom? Did he even exist? When submitted to rigorous analysis, the biblical texts actually reveal quite another story. I think that the evidence now shows that the people of the Bible believed in many gods. And the scribes who composed the Bible did their best to conceal this – but not altogether successfully. If humankind didn’t fall away from God in the first place, we wouldn’t need a redeemer. 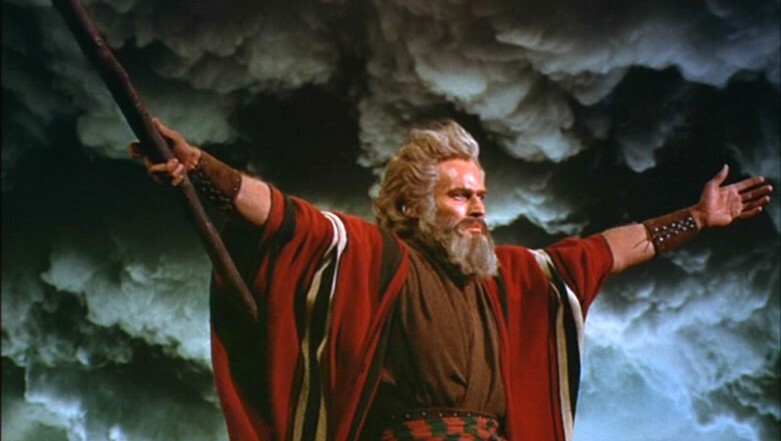 Passover In Egypt: Did the Exodus Really Happen? This question has puzzled biblical scholars, archeologists and all those interested in solving one of the Old Testament's most intriguing mysteries. Was the story of the Israelites fleeing Egypt after years of slavery history or myth? Were there really 10 plagues that became so progressively terrible that they forced the Pharaoh to finally release all the Israelite slaves? Was there really a leader named Moses, and did he guide this "mixed multitude" for 40 years in the wilderness of the Sinai desert? Passover is the Jewish festival that celebrates the flight of the Israelites out of Egypt. 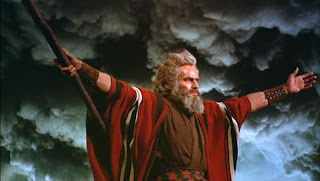 During this Passover season it is particularly pertinent to wonder, did the Exodus really happen? He looks at four pieces of evidence that he seems to suggest lends credibility to the story. He discusses the (1) The Ipuwer Papyrus; (2) The Israelites' Travel Itinerary and the Egyptian Maps; (3) Aper-el's Tomb; and (4) The Shiphra Papyrus. You can read the whole article here. Of course, if none of this convinces you I am sure that the below video will demonstrate the historical veracity of the Exodus story. Congratulations to Miles Larson. He is the winner of this week's book giveaway. 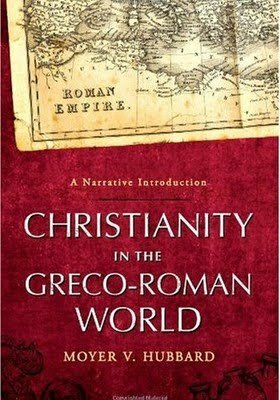 Christianity in the Greco-Roman World: A Narrative Introduction. For those of you who did not win this time, check back again in the near future when there will be more opportunities to win some other great resources.